​Vinod Bharti is yoga, Laughter Yoga, Stress Management, Energy Healer, meditationTeacher and Healer. He has been sharing his meditation in India, Europe, Taiwan , China etc .From last 14 years. 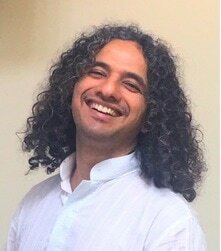 He has been assisting people on the path of meditation, , healing body, mind and soul by healing therapies and Zen meditation, healing with healing laughter yoga, help people rediscovering their joy and playfulness in their life , discover real meaning and purpose of their life through specially design meditations techniques for busy people. ​The main purpose of this website is to help busy people learn meditation and make it a part of their busy life. Meditation is easy and simple. The main purpose of creating this website is to introduce different kind of meditations which I have try in my life over the year and transform my life. I was seeker of meditation, yoga and healing since my childhood. I have tried different paths of meditation, Buddhism, Hinduism, Taoism, Sufism, yoga , osho’s meditation, christian meditation along my journey. This website is little effort to share what I have learn over the years. I will try my best to bring best of knowledge and experience which i have learnt over the year will share with all of you. When we hear the word, meditation, immediately image popups in our mind something difficult, something serious, sitting long time in lotus posture, it is hard. Over the year i also try hard to achieve meditation state and meditation experience, more i try more i failed , after failing hundreds of time in my all efforts to achieve meditation state, finally i ask question to myself. what i really love? what is my passion? what is the things which i enjoy the most. Over the year i found out that what things which you do with total heart , can be best way to start meditation with. And the best thing which i love is dancing, singing, laughing and playfulness. More i allow my self to play, more allow my self to dance and and be playful, i found out my meditation become effortless. It become more fun, more of non doing rather than doing something. By playful way i learn , by being innocent and childlike i more easily dip in to myself. I have tried different kind of meditation which i have mention in my blog Posts. You can start your journey from anywhere you like. But to rememebr one thing in order to enter in to meditation playful heart is needed. many of meditation techniques mention in my blog posts are to make you more playful and relaxed and tenstionless. And one more important thing is taht Only meditation is not enough, meditation plus love both will transform your life totally. For me meditation is one wing, love is another wing, we need to balance both and become harmony with each other. Some people do meditation but dont love it. If this is the case it is very hard to reach center of your heart. So both quality is needed meditation plus love for deep meditation experience. So in this website, you can explore different kind of meditations, with different background. Try this meditations, apply in to your life, your life will be transformed totally if your meditation plus your love is combined together. Meditation plus love is secret key to all success, beauty, abundance in life. If only meditation it is too serious, dull, but if it is combine with love it become alive, playful, enjoyable. Being a busy person myself, I can easily relate to the problems a busy person (especially those living in an urban environment) faces while trying meditation. Therefore, apart from publishing content on this website about meditation, I shall be publishing various helpful articles on our Blog about managing a busy life successfully. I am also in the process of writing a book on meditation for busy people. Contact me here to know more about it. I strongly recommend you to subscribe to the newsletter of this website. It’s absolutely free and apart from updating you on the latest articles on this website, it will act as a gentle reminder to you for meditation. I wish you success in your spiritual journey !